Behind the dramatic fall in the gold price has been the subject of countless conspiracy theories that all pretty much center on the notion that the entire global economy revolves around gold. The only tangible conspiracy by governments is to hunt down as much cash as they can. The real secret strategy of central banks is to shut down the black markets. That is not gold exclusively. Even when I was in Paris recently, the ATMs will not give more than 200 euro compared to 1,000 in Germany or a 1,000 SF in Switzerland. France is hunting everything – not just gold. The real policy is to regulate the underground economy. 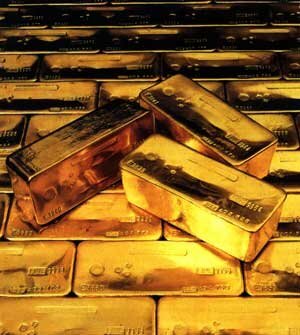 Even the USA now requires all refining of gold to be accounted for who sent it in and when was it shipped. The sales-pitch that the gold market is somehow suppressed to accomplish what is very strange. Central banks and the NY Bankers have no interest in pushing prices down. For what purpose? So the former Communist central banks can buy cheaper? Or so the Goldbugs lose money and pay less taxes? None of this makes any real sense. The central banks are still the largest holder of gold. Money has graduated far beyond paper – it is electronic now. There will be no gold standard and sorry, but money does not have any tangible requirement historically. 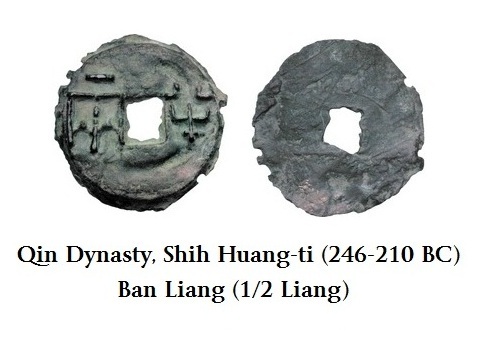 Asia never had anything but FIAT money since 240BC. So all these wild stories and claims of gold standards for thousands of years are lies and exaggerations. Just because precious metals were used as coins does not make that a “standard” with fixed values. 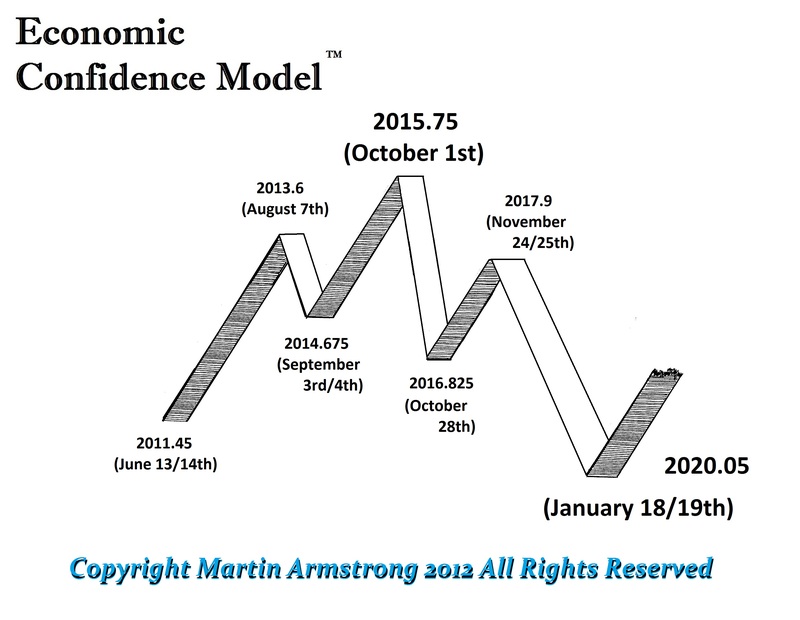 Standards were ONLY attempted since the 1800s and they always failed like Bretton Woods because money rises and falls in value with the business cycle. So what is really going on? First of all, it does not matter what market we talk about. Anything that rallied for 13 years must take a pause. 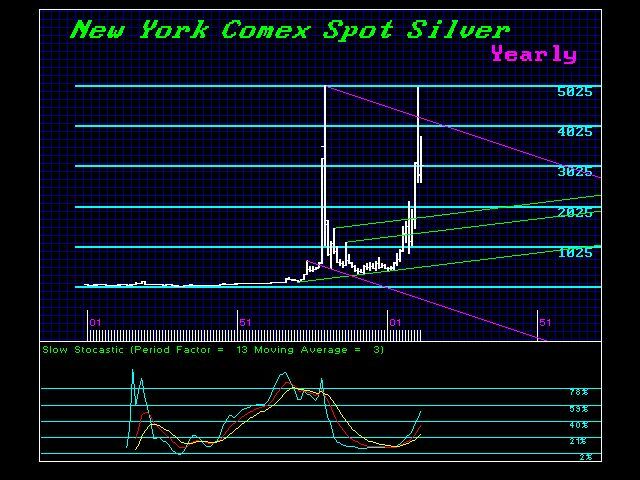 Silver NEVER made new highs in the spot market above 1980 and gold never exceeded the 1980 high when adjusted for inflation that remains $2300. Secondly, the real issue is taxes and the hunt for money. The various governments are trying very hard to close down ALL cash avenues forcing people into the new electronic world. As of January 1st, 2014, the USA will be reporting all accounts in the US held by Europeans to Europe. They are trying to close down the last escape route any investors have outside of the banking system. An American cannot store precious metals in Europe any more. Americans have been thrown out of banks in Europe and in Asia HSBC refuses to accept any account from an American. This is the DEFLATION I have been warning about! Forget HYPERINFLATION for that presumes that government will try to honor their obligations. They will destroy the world economy before that ever takes place. This is not some conspiracy that merely targets gold. This is a full-blown assault on the free markets and anything that can be used as an escape hatch from taxation. This is why real estate is starting to rise – it is outside the banking system. So what will they do next? Confiscate all real property and go full Marxist? If you do not open your eyes and continue down this path of assuming it is a conspiracy to lower gold prices for some strange reason, you will lose your shirt, pants, house, and maybe even your family. Governments use to sell captives into slavery as the spoils of war. The King of England practiced indentured servitude where for any misdemeanor he sold you to industry for a period of years and removed you from your family. At the time of the American Revolution there were 240 felonies all carrying death so the king took all your assets and threw your family out on the street. Government routinely sold people and called them criminals all to make money. 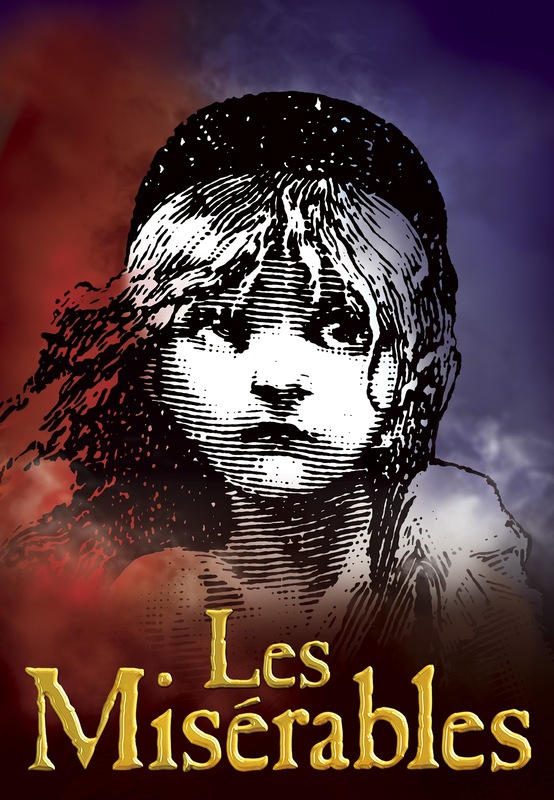 Ever see les Miserables where the man is imprisoned for 19 years for stealing bread to feed his sister’s son? He was hounded for life and the state could seize him at any time and sentence to work for them for free. The is what governments did to the people. It was standard and the policeman who chases him all his life is indoctrinated and brain washed that any infraction desires the forfeiture of freedom for your entire life. It is the “law” he always repeats without any hint of humanity or independent thinking. He becomes the mindless drone of the state. 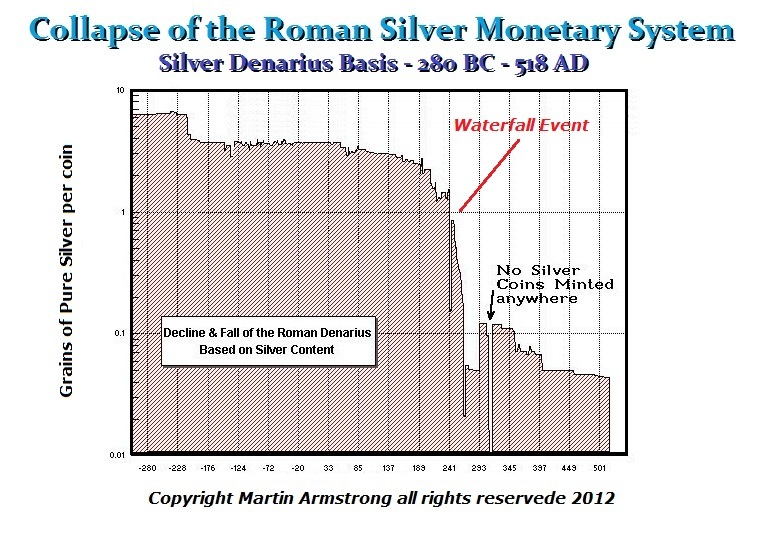 This is how Rome fell – it was not hyperinflation. People abandoned the cities and their property because of taxation. Everything lost value including gold because the rule of law collapsed. How cannot have anything of value when you cannot enforce any rights, privileges, or immunities no less enforce a contract with who – the judge who only rules in favor of the king? Hopefully, we will see a huge political blow-out in 2016. The global economy will turn down even harder than it did in 2007-2011. Perhaps, just perhaps, we will blink before it is too late. But what causes political change is ALWAYS the free markets. They MUST move to extremes. That is the mechanism that forces change. If nothing happens, why change anything? We must move to extremes and that is what creates the chaos for the next cycle turn. Without the free markets putting pressure on the system so that it collapses by implosion, history would be a straight line. 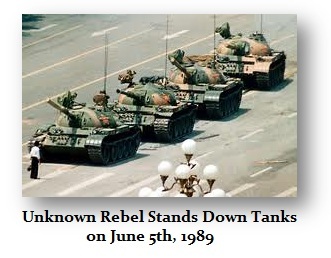 Hopefully the troops will hesitate and will not plow down the people as we saw in China. 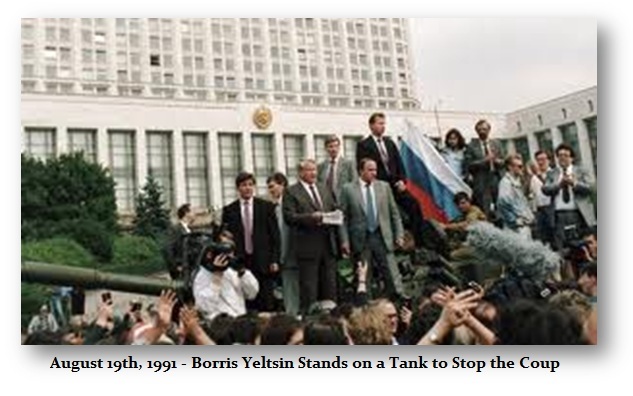 In Russia, again the political change took place ONLY because the troops stood down and Yeltsin became famous by climbing on the tank to plead with the troops not to kill civilians. That day will come in Europe and in the United States. Perhaps we will blink if the troops and Homeland Security wake up and see the people are not terrorists. They are being indoctrinated to fire on the people for anyone who objects is a terrorist or a criminal. The government called out the troops and used tanks against American veterans calling them criminals. That cost Hoover the election more than anything else. SO our day will come. It always does. The question is – will we blink? It is a shame that all the conspiracy theories are pointing in directions away from the only thing that repeats throughout history – confrontation. The majority MUST be wrong in all things for that is what causes the collapse or the blowout rally. It is the extreme volatility that forces political change. ALWAYS!!!! THERE ARE NO EXCEPTIONS! This is not about suppressing gold. This is about FREEDOM!